In October, I checked one of my trail cams and was scrolling through the various does and a few bucks when I cam across one pic of a really big non-typical. I was shocked. My friends and I from work nicknamed him the Freak. Since the only pic I got of him was at night, I figured he was probably mostly nocturnal. When I knew the rut was in full swing and the wind was right, I started hunting hard every day. 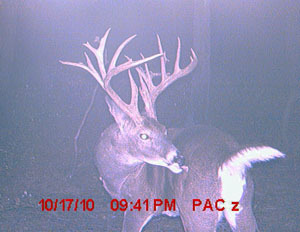 On the morning of Nov 7, 2010 he came past me at about 50 yards and stopped. Normally this is a little far for me, but I had recently been practicing at that distance in anticipation of a elk hunt out west. He was broadside and stopped so I let the arrow fly. He immediately kicked his hind legs and haunced up. Tell tale signs of a gut shot. He slowly walked off and I left my stand to let him lay. After going home and reading a book I have on finding wounded deer, I waited the recommended 6 hrs, which was actually 6 1/2, then started tracking him. I couldn't find blood so I went in the direction where I last saw him. 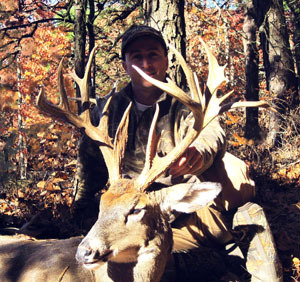 I bumped him not 125 yards from where I shot him. It looked like a small bush on his head as he ran off. I immediately backed out and went home to give him more time. The next day it rained and snowed, surely wiping out any blood sign. I proceeded to look every day, sometimes 3-4 hours per day walking with my Lab named Chase in search of him. I had blisters on my feet from walking so much. After doing grid searches farther and farther from where I saw him go, I was losing confidence with each passing day. On November 13th, I checked a pond (that was pretty much dried up) where I thought he might go looking for water. I was walking about six yards from a thicket next to the pond when my dog got wind of something and went in the thicket. There he was, "The Freak" lay dead. Both hind quarters were completely eaten,but I had found him. I got on the cell phone and started calling everyone. I was so relieved. Six sleepless nights and many many hours of walking were over. He has 24 points and I had him officially scored at 192 1/8” net. I also took him to the Dept. of Environmental Conservation to have him aged, he was 7 1/2 yrs old. I don't think he was going to get much bigger.